Located in the heart of Montréal on Canada's largest shopping strip, and door to the famous underground city, the Montréal Eaton Centre has over the years become home to prominent attractions downtown. Each year the Centre welcomes 23 million visitors. The number one shopping destination in the city, the Montréal Eaton Centre features over 130 shops and restaurants, as well as the famous Grévin Montréal wax museum, all spread over 5 floors. The Centre also features one of the largest food courts in North America, with free wireless Internet access. 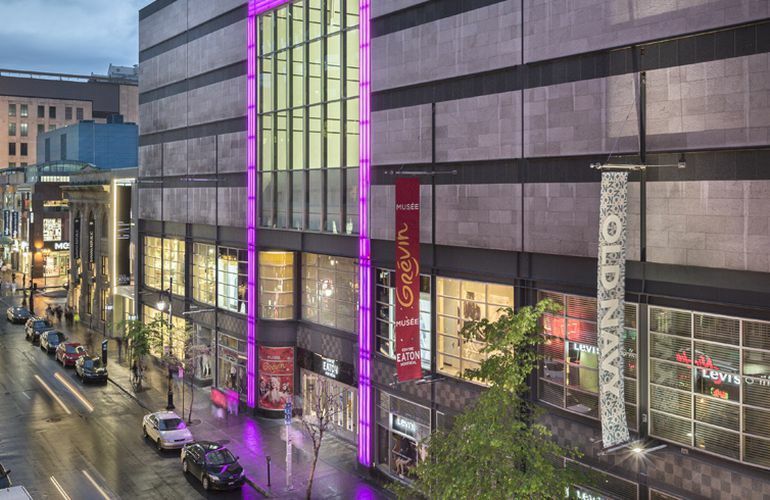 Steeped in the excitement and creativity that make Montréal such a fascinating city, the Montréal Eaton Centre is proud to be associated with Art Souterrain, Groupe Sensation Mode and Destination Centre-Ville Montréal, and regularly host artistic and cultural events. The Montréal Eaton Centre is proud of its partnership with social organizations that play a major role in Montréal and Québec society through their environmental efforts or social responsibility. We have work for years on various projects with Dans la Rue, the Starlight Children's Foundation Québec, Earth Day Québec, Allo la Terre and RecycFluo. The Montréal Eaton Centre is property of Ivanhoé Cambridge.